Cold weather doesn't mean that you have to banish yourself to the treadmill all winter long. 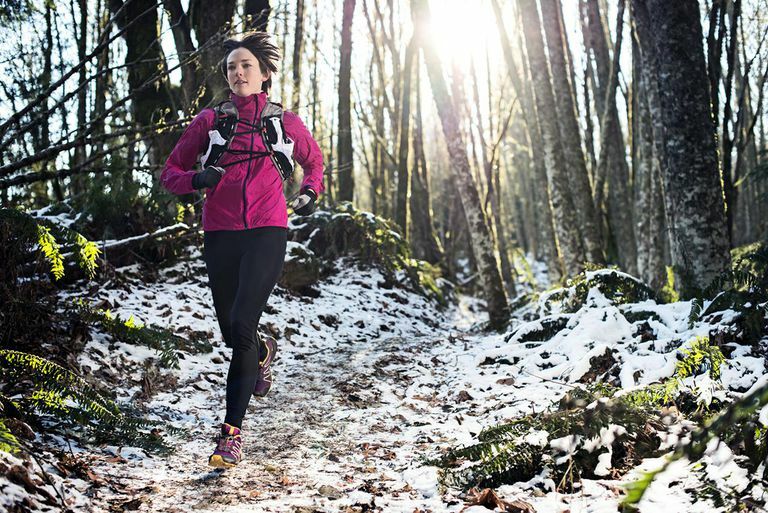 Because of new technology in winter running clothes, gone are the days when runners trudged through outdoor winter running workouts wearing lots of heavy and uncomfortable clothing. Follow these tips and you'll be able to run safely and comfortably in the cold weather. Thermal hat: A fleece or wool hat is perfect for keeping your head warm during winter runs. You can easily tuck it into your pants if you feel like you're starting to overheat. Neck Gaiter or Bandana: Often worn by skiers, a neck gaiter can be extremely valuable on a frigid, windy day to protect your neck and face. You can pull it up over your mouth to warm the air you're breathing in, which is especially helpful when you first start your run. Some runners wear a simple bandana over their mouth for the same purpose. Another alternative is a Buff, which is a seamless tube of microfiber fabric that can be worn in many ways, including as a balaclava. Balaclava: Also known as a ski mask, a balaclava is a type of headgear that covers your whole head, exposing only your face or part of it, and sometimes only your eyes. They're usually made of fleece or wool and are only necessary if the temperature or wind chill is below 10 F.
Skin and Lip Protection: Cold weather and wind can chap your lips and make exposed skin crack. Protect your lips with Chapstick or Vaseline. You should wear sunscreen as the winter sun and glare off of snow can give you sunburn. You can also use the Vaseline on your nose and cheeks (or anywhere else on your face) to prevent windburn and chapping. Wicking Base Layer: The layer closest to your body should be made from a synthetic wicking material, such as DryFit, Thinsulate, Thermax, CoolMax, polypropylene, or silk. This will wick the sweat away from your body, keeping you dry and warm. It's very important to make sure you don't wear cotton for this layer because once it gets wet, you'll stay wet. When it's above 40 F, you can usually wear just a long-sleeve base layer. Insulating Layer: Your second or middle layer, which is needed for very cold weather (below 10 F), should be an insulating material, such as fleece. This layer must continue wicking moisture away from the skin. It should have the perfect balance of trapping some air to keep your warm, yet release enough vapor or heat to avoid overheating. Some fabrics suggested for your second layer include Akwatek, Dryline, Polartec, polyester fleece, microfleece, Thermafleece, and Thermax. Windproof and Waterproof Outer Layer: This layer should protect you against wind and moisture (rain, sleet, snow), but at the same time allow heat and moisture to escape to prevent both overheating and chilling. It's a good idea to wear a jacket with a zipper for this layer so that you can regulate your temperature by zipping it up and down. Suggested outer layers include ClimaFit, Gore-Tex, Microsuplex, nylon, Supplex, and Windstopper. If it's between 10 F and 40 F, you can usually get away with a wicking base layer and an outer layer. Gloves/Mittens: You can lose as much as 30 percent of your body heat through your extremities, so it's important to cover those hands. On cold days, wear gloves that wick away moisture. When it's extremely cold, mittens are a better choice because your fingers will share their body heat. You will need to consider what you wear on your legs and feet in order to enjoy your winter runs. Tights/Running Pants: Your legs generate a lot of heat so you don't need as many layers on your lower body. You can usually wear just a pair of tights or running pants made of synthetic material such as Thermion, Thinsulate, Thermax, Coolmax, polypropylene, and/or silk. If it's below 10 F (temperature or wind chill), you may want to consider two layers on your lower body—a wicking layer of tights, and a wind-proof layer such as track pants. Shoes: Your feet also stay pretty warm as long as you keep them moving and dry. Try to avoid puddles, slush, and snow. Look for a running shoe with as little mesh as possible, since that's where the water will seep through to your feet. If you can't avoid running in the snow, you may want to think about buying trail running shoes, which are somewhat waterproof and will give you a little more traction in the snow. You may also want to try YakTrax Ice Grippers or other brands of ice spikes, which slip right over your running shoes for added traction. Socks: Never wear cotton socks (in cold or warm weather) when running because they won't wick away the moisture, leaving your feet wet and prone to blisters. Instead, be sure to wear a good pair of wicking socks made of fabrics such as acrylic, CoolMax, or wool (in the winter). Modern wool blends such as SmartWool are itch-free and are machine-washable and dryable. If you wear thicker socks in winter you will need to see how they fit in your running shoes. You may need to buy a half-size larger or get a wide model.